Forthcoming. "A Physiology of the Inglorious Artist in Early 19th century Paris." in The Mediatization of the Artist. Ed.s Rachel Esner, Sandra Kisters. Palgrave MacMillan. By drawing parallels between Henri Murger's Scènes de la vie de bohème and a rich graphic tradition of the artist, satirized, this contribution explores the satirical origins of later representations of the bohemian artist, elaborating upon Mary Gluck's notion of ironic bohemia. 2017. "Le regard miroité, miroité: Le Voyage d'Encausse et le récit de voyage humoristique." Biblio 17. 73-81. This contribution, which grew out of a seminar paper for Michèle Longino and was presented at the NASSCFL 2014 conference in Marseille, examines the way in which a satirical voyage account, Chapelle and Bachaumont’s Le Voyage d’Encausse, interacts parasitically with its referent, travel literature. 2016. "A Satirical Image against Jean-Baptiste Greuze: Reputation, Professional Association, and the Public Woman." Eighteenth-Century Studies. 50.1: 27-51. Drawn from the last chapter of my MA thesis, this article examines an understudied caricature against Jean-Baptiste Greuze and his wife, Anne Gabrielle Babuty. This etching, which exists in three states in Canadian and French collections, allows us to reevaluate the public reception of Greuze’s post-1769 withdrawal from the Paris Salon, and his increasing reliance on reproductive engraving, publication, and association with engravers. 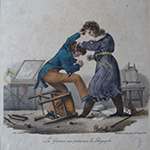 This paper, which won the UAAC Graduate Student Essay Prize after its presentation in the UAAC 2014 conference in Toronto, ON, examines a pair of caricatures that were restruck (or republished) several times over the course of the early eighteenth- and early nineteenth-century: the Comte de Caylus’ Assemblée de Brocanteurs and the anonymous Carnaval de Jupiter. By engaging with the approaches of visual studies and material culture studies, and by revisiting Walter Benjamin’s “Work of Art” essay and Miriam Hansen’s interpretation of it, I propose that restrikes allow us to nuance the way in which we understand the relationship between original and reproduction. 2015. "How to Burlesque a Burlesquer: Paul Sandby's A New Dunciad against William Hogarth." in The Power of Satire. Amsterdam: John Benjamins Publishers: 105-133. This essay addresses elements of Paul Sandby’s satire, Burlesque sur le burlesque, that have continued to evade scholars of Hogarth and English caricature - the french language titling in its first state, and the 17th century French connoisseur standing over Hogarth's shoulder - by contextualizing the caricature's attack against Hogarth's Analysis of Beauty and his stance in the English Academic Debates. TOC for The Power of Satire. I have presented my research on Greuze, art-world caricature, and popular printed imagery internationally and in English and French. This includes the Institut national d’histoire de l’art in Paris, the College Art Association, the Association of Historians of Nineteenth-Century Art Dahesh symposium, the American, Canadian, and International Societies for Eighteenth Century Studies, the the Nineteenth Century Studies Association, the Association francophone pour le savoir, the University Arts Association of Canada, and the North American Society for Seventeenth Century French Literature. Please see my CV for a selected list of my conference presentations. In 2017-2018, I will be presenting my work on Qualitative Data Analysis in October at the Bibliography Among the Disciplines conference in Philadelphia, PA. I will also be presenting my work at CAA 2018 in Los Angeles. “Art, Commerce, and Caricature: Satirical Images of Artistic Life in Paris, 1750-1850” focuses on a set of 486 satirical images that I have collected, documented, and databased in qualitative data analysis software called NVivo. These images target individuals, events, and institutions within Paris’ late eighteenth- and early nineteenth-century art-world. My research has revealed that artists contested the presentation of their status as professionals or as having a vocational relationship to their practice through the construction of an alternative, satirical, and critical category: the inglorious artist. Within this social type, artists are presented as cultural workers struggling to achieve success and produce their work in the face of economic precariousness elicited by rapidly shifting expectations for their formation, patronage, and production. "Art World Sociability and Communication Networks: Following the Print Trail of Jean-Baptiste Greuze" is a 200 page, three chapter thesis, available on Proquest, that analyzes Greuze's representation in and use of print media in the eighteenth century. In particular, I track the rise and fall of his celebrity before and after 1769 by examining his treatment in periodical print and art criticism. I examine Greuze's oeuvre of reproductive engravings and their advertisement. Lastly, I conduct an in depth analysis of an anonymous satirical image against Greuze and his wife, Anne Gabrielle Babuty. 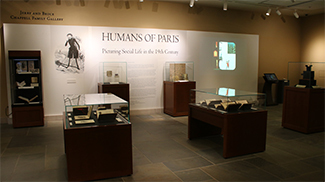 This exhibit explores early nineteenth-century sketch writing and illustration for popular audiences in Paris, most notably the Physiologies pamphlets and large panoramic folios such as La Grande Ville. Illustrated by renowned artists like Honoré Daumier and Paul Gavarni, these objects elaborated an encyclopedia of caricatural social types. I put these objects into conversation with the larger history of the popular printed image in the early nineteenth-century, the science of physiognomy and phrenology in the late eighteenth and nineteenth centuries, and the history of spectacular entertainment, most notably early film and the magic lantern. This pair of exhibits, co-curated with my colleagues Alexis Clark, Emilie Luse, and Laura Moure Cecchini, sought to expose audiences to France’s vibrant turn-of-the-century cabaret culture via the print matter that emanated from that culture itself. Our goal was to provide visitors with a multi-sensory experience of cabaret culture in order to contextualize its sonic environment, the raucous and radical atmosphere of our cabaret venues and Montmarte, and to expose them to the tactile experience of the consumer culture that arose out of this culture, which permitted audiences and fans to own sheet music themselves. 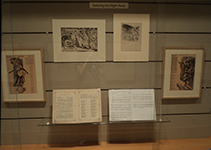 Our exhibit thus drew upon illustrated sheet music from periodicals and magazines, tour guide books, maps, and posters. The Duke New Music Ensemble interpreted the sheet music we recovered and visitors in both spaces were able to listen to their compositions while they viewed the exhibit. Take a look at a blog post on the Nasher exhibit, and the online exhibit for the Rubenstein exhibit. 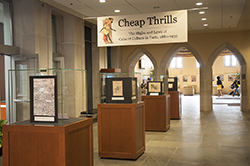 Curated with my colleagues Alexis Clark and Emilie Luse under the supervision of Neil McWilliam, this exhibit introduced visitors to the caricatures and imagery produced around the Dreyfus Affair. Our goal in this exhibit was to go beyond the mere presentation of this rich and difficult imagery. Rather, we wanted to provide visitors with a sense of the visual landscape within which the Dreyfus caricatures fit, which included antisemitic imagery more generally, news items that provided illustrations of the prolonged Dreyfus case from L’Illustration and Le Petit Journal, and satires that targeted issues that resurfaced anew during the Dreyfus Affair including infighting amongst the periodical press, the xenophobism in early French nationalism, and the growth of radical leftist periodicals and journalists. Take a look at the online exhibit. I am committed to opening up the museum to diverse audiences, and have been working in museum education departments since 2006. My school and family programming experience, which is outlined in more detail in my CV, has ranged from French-English bilingual interpretation of a variety of museums, including visual art, photography, the Canadian War Museum, and a 1930s rural Ontarian printshop; to researching programming, evaluation systems, and pamphlet guides at the National Gallery of Canada, the Walters Museum of Art, and the Cumberland Heritage Village Museum. I am particularly committed to helping cultural institutions both learn more about the audiences they attract, and reach underserved, marginalized communities. See my CV for a complete list of my education and programming experience. As an artist and an art historian engaged in the digital humanities, I feel that the tools with which I work play an instrumental role in my scholarly and creative output. I greatly enjoy learning new tools, and I also enjoy teaching them to others. I have taught a variety of software programs in creative and technical capacities. 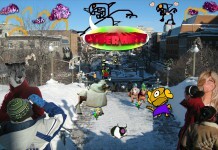 In particular, I taught a digital arts class to ages 9 to 12 and to adults at the Ottawa School of Art for four years, where I exposed students to Photoshop, Illustrator, and Flash. I have been running a “Photoshop for Art Historians” workshop at the National Humanities Center, and have also run a workshop on “Image Databases for Art Historians,” and have made presentations in Canada, France, and the U.S. I use Qualitative Data Analysis (QDA) software heavily in my research to work with large corpi of images. In particular, I use a software called NVivo which allows me to catalog, annotate, and query my images. I am currently a Research Advisory Board member for NVivo. If you would like to see how I've used NVivo in my research, you can watch this recording of my webinar. This class surveys the history of art from the Renaissance to the Twentieth-Century. The artworks discussed stray from the conventional textbook-based survey. Rather than consider art via its exhibition or aesthetic value, I encourage students to consider other types of use value. As such, the class focuses on a smaller number of works and emphasizes deep visual analysis and case studies. We engage with decorative and contextualized art through the following themes: religious worship, private and public spaces, and the art market and exhibitions. This class examines the production and design of news from the fifteenth century to the present, or in other words, the history of news as a medium and visual experience. We do this by exploring the relationship between medium, design, content, and image. The class examines objects as diverse as astrology pamphlets, libel, periodicals, news aggregator apps, and satirical news such as The Daily Show and The Colbert Report.